I wrote earlier about typing iPhone email in landscape mode. Since that time, I've upgraded to a similar "paid" application, EasyWriter Pro. The improved version costs $2.99. For the equivalent of a small bag of chips, you get several additional features including a spell checker, email favorites, and and text snippets for frequently used text. The spell check and snippet functions put this application above the rest. If you frequently find yourself emailing your pizza order with a triple order of Jalapeno peppers, you can simply save it as a snippet and order your fireball pizza with a few key clicks. Once the email is complete, you tap the "Send to Mail" button and EasyWriter Pro drops it in for you, ready to go. 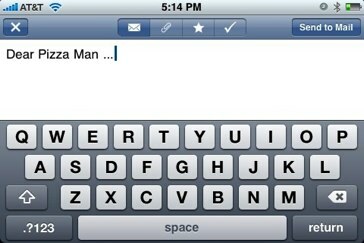 It is remarkable to me that Apple never upgraded its iPhone mail application to rotate to landscape for easier typing. With EasyWriter Pro, that itch can be scratched immediately.